I'm not sure if I've talked about The Body Shop much around these parts before but they are one of my favourite places to buy shower products. I don't go there very often, because I have it in my mind that it is expensive. Now I think about it though their products do last a lot longer than some of the other shower-products I use and they also don't tend to lose their scents as easily. 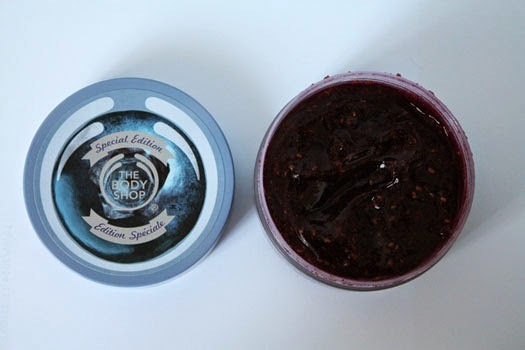 Recently I ran out of this scrub so I decided to replace it with the Blueberry Body Scrub-Gelee, a limited edition product. This scrub looks good enough to eat and it also smells heavenly. It reminds me of luscious summer berry desserts. The texture itself is more jelly-like as the name would suggest but once you start applying the scrub it becomes grittier. It does have quite a grainy texture to it but this really helps to buff away dead skin cells. You're also left with smoother, softer skin post-shower and if you follow up with a body butter you really have a winning combination. The scent itself doesn't linger, but if you did like it you could always follow up with the body butter to prolong it. The fact that I love blueberries means this scrub-gelee is a winner for me. It really is such a divine product to use. Not only is it deliciously scented, it also helps to combat dry, scaly limbs which seems to affect many of us in Winter. If you're not a fan of blueberries, there's a raspberry scented scrub being released later in the year which may take your fancy instead. *Have you tried the Blueberry Scrub Gelee? What did you think of it? I love the body shop. I must try this when I am next there!